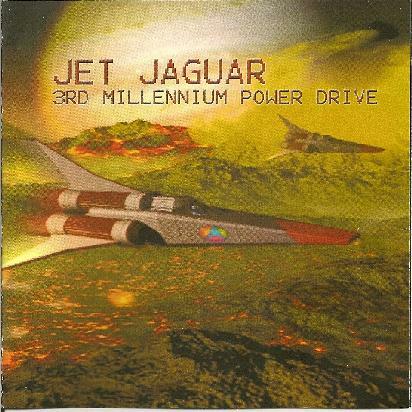 Jet Jaguar - "3rd Millennium Power Drive"
Charles and the Jet Jaguar crew are back with another jet propulsion fueled space rock adventure. The CD contains 9 studio tracks, 4 of which are instrumental and one live track. These tracks were recorded back in 2005 and 2006. The opening track is quite spaced out to start but then we are off as the band does what they do best. Frontier 2053 is a short synth bridging piece by Charles. Cruise Mode is where that phased out thin guitar cuts through like a knife. The drums are mixed too high for my liking on this track though. It dominates too much and puts everything too far in the background. Not the strongest track. Out in the Moondocks has a lush and spacey beginning and the lyrics are like a space age computer reading them until 2 1/2 minutes when the rest of the band kicks in. I liked this one. A city in Xenon has some really lush synth layers and a dreamy atmosphere. Spider Rose starts with a heavy bass line and bubbling synths before that razor edge, Helios like guitar bursts onto the scene and the vocals are spaced. Nice spacey ending to this one. Burning through the Dyson Sphere is another instrumental piece but not all synths. A cool mid paced groove takes the band to that special place. Nice. Eyes of the Sphinx features a guest flute player at the very beginning for like 2 minutes before the real track begins. It does not sound like any of the Nik Turner';s Sphinx stuff at all. Icehenge is a total spaced out synth piece with a quite dark mood. The CD ends with a live instrumental track from Houston 2005. Great stuff. I hope that one day this band can get into a real studio and lay down some better drums. I love most aspects what this group is doing but I just don't like the bass and drum mix much. A great song is a great song and there are quite a few here so enjoy!